The manager of the diving centre, located directly on the sandy Beach is Dieter Merz (Düde) from Switzerland. His team of diving instructors and dive masters speaks English and German languages and instruct to SSI, Barakuda (CMAS) and PADI standards. The dive center was built in 2004 and consists of antique wood. 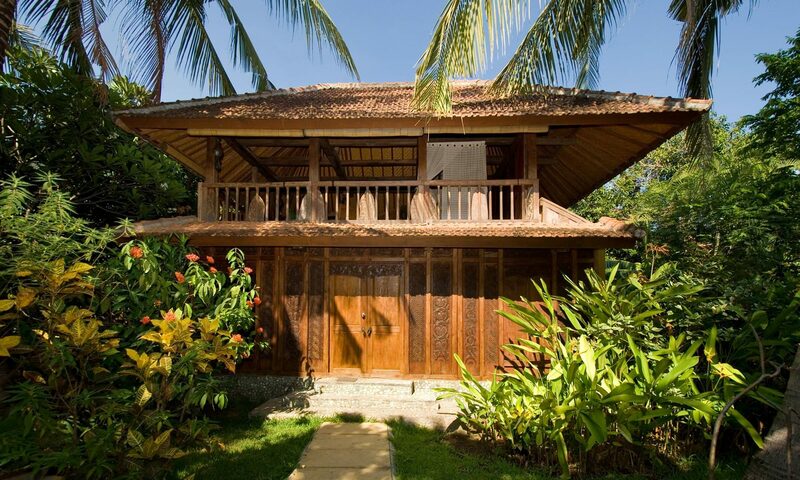 It is directly on the sandy beach of the Pondok Sari Resort and will be equipped – as are all WERNER-LAU-diving centres – to cater for the special requirements and desires of the divers. To ensure that everything runs smoothly, we have 130 Aluminium tanks (12 liter, DIN + INT), 12 x 8 liter Aluminium tanks available. The tanks are filled from 3 Bauer Compressor. Nitrox for free goes without saying, like all Werner Lau Diving Centres. A well equipped workshop is also available for use by the guests if needed. The members of our staff are always ready to give advice or lend a helping hand. Both the privately-owned and the hired equipment are kept in the diving centre. To provide our guests with an all round service the equipment will be loaded onto the boats by members of our staff, who at the end of the trip will also bring the equipment back, rinse everything in clear water and store all the equipment in the diving centre. The boats are equipped with oxygen, a radio and an emergency first aid kit. A doctor, whose specialities include diving medicine, and who also supervises the decompression chamber has his practise in Denpasar. (Sanglah General Hospital, Diponegoro Street). We offer a multitude of diving possibilities for every diver: Participation in the Coral Project involves shore diving, and is particularly suitable for discover local scuba, Introductory dives, Refresher courses and OWD, and offers „fish fulfillment/satisfaction“ already from the first dive. Night diving is also well incorporated in the Coral Project, and has already transformed some Macro-fans to speechless astonishment. The visibility during shore diving can however, be influenced during certain months (February, July, August) by wave action and surface conditions. Local dive sites are located along a 2000m stretch of coastline. Starting at 4-5m they drop down to depths of between 30/40m. Stunning intact corals, a multitude of Macro-life and occasionally big fish, can be seen, along with the usual numbers of different kinds of fishes. Secret Bay is the ultimate „Macro heaven“ underwater, where critters otherwise seldom seen in other parts of the world, can be found. For a distance of about 150m , wire cages have been placed at a depth of three to seven meters in the water. The minor electric current (12-20 V, 5 Amp) which runs though these cages is harmless, even by direct contact, but it results in the corals here growing at a speed 4-5 times quicker that in other areas. It is interesting to see the fish and fish shoals which seek refuge among these corals. The rest of our local dive sites also promises interesting discoveries and fans of macro photography will be delighted. The outdoor temperature is 28 to 35 degree Celsius. Water temperatures: January until June as well as September until December 29 to 30 degree Celsius. July and August 26 to 27 degree Celsius; for the boat trips during this time we recommend a light wind jacket because oft he fresh wind. Secret Bay: 22 to 25 degree Celsius; we recommend to wear in addition a short wetsuit (Shorty) from the dive center over your normal wetsuit. Dive season: whole year; we especially recommend the months March until June as well as September until December. Dive conditions may be worse in January/February as result of the rainy season with the north west of Bali generally being the most dry area in Bali. In July and August sometimes there can be high waves at the shore; shore diving might not be possible then. At these times our boats will start and end at the small Pemuteran harbor. In just a few minutes we will transport our divers by car. For this season we recommend to use a light outdoor jacket for the boat trips because of the fresh wind. Dive highlights: Wonderful corals of any kind, macro diving like in „macro heaven“, the big coral breeding project as an ideal dive spot directly from the sandy beach. Worldwide known: The dive spots at Menjangan island and at Secret Bay. Calm and easy dive area, for beginners as well as for experienced divers. Dive qualifications: Internationaldive certifications, at least OWD level, logbook. No number of minimum dives required. Medical dive certification is recommended; in any case the diver has to confirm and to sign that there are no health reasons which do not allow diving. As water temperatures are between 26 to 29 degrees Celsius, a 3mm to 5mm wetsuit will fit. Exception: Secret Bay; there the water temperature sometimes can fall down to 22 degrees Celsius. Therefore we recommend wearing a short wetsuit in addition to your normal wetsuit. (This Shorty can be hired at the dive center). 220V, fits tot he German plug-ins. In the dive center payment can be done cash (Indonesian Rupiah) or in Euro at the actual rate. ATM are in 5 minues and 10min walking distance. One time money withdraw maximum around 100 Euro. Up from 1.01.2015 CC payments only with a 6-digit PIN possible. 0.65 Euro per dive as a service charge fort he staff, 15 Euro entrance fee (resp. 20 Euro on Sundays and national holidays) for Menjangan Underwater National Park (2 dives), 6,50 Euro entrance fee for Secret Bay (2 dives). They can enjoy snorkeling directly from the beach as well as join the divers` boat. Boat trips are allowed to children ongoing from the age of 8 years. More activities: see under “sight seeing”. The Underwater Nationalpark Menjangan is also an excellent offer for snorkelling. light summer/beach clothes; in the evening casual or shirt/trousers combination, depending of the hotel category. For sight seeing trips a light outdoor jacket and sport shoes are recommended; for the ladies shoulders and knees have to be covered for entering the temples, sarongs can be hired. During the rainy season which is mostly in form of rain showers most oft he hotels will provide umbrellas to their guests. It is a not yet touristic street village with some hotel restaurants and lots of small local restaurants and shops. The local people are very friendly and hospitable. No beach selling, no night bars or discos. Quiet and sure village for tourists who are looking for an authentic Balinese area. As a guest you will bepart oft he daily village life including all the temple ceremonies. Often the guests are invited to private ceremonies. One oft he most famous temples in Bali, the so called monkey temple, is located directly before the entrance oft he village, other temples are nearby. Trekking tours in the West Bali National Park are possible. Excursions to Java island as well as local Bali trips are offered.